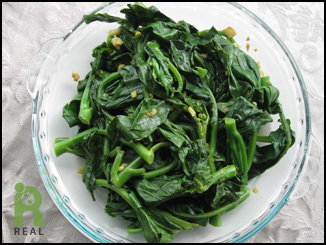 I love my dark leafy green vegetables prepared in a variety of ways. When I would sauté them I typically used garlic and onions. But I could never make them at home to taste like they do at one of my favorite restaurants, Buddha Bodai in Flushing and Manhattan. The Flushing restaurant recently moved and is now called the New Bodhai. They prepare a vegan Buddhist style cuisine that doesn’t use garlic and onions. So how did they make their greens so good? I just figured it out, it’s so simple. It’s all in the ginger. 1. Wash and drain the greens. 2. In a large stock pot, add water, about 3 inches deep and bring to a boil. Add the greens, cover and cooked for no more than 5 minutes. 3. During this time, lightly oil a heavy skillet or wok and turn heat to medium high. You may use the dry sauté method without oil as well. When the pan is hot, fry the ginger for about 2 minutes, stirring regularly. Do not let the ginger burn or get too brown. If the ginger starts to stick, add one tablespoon of water at a time as necessary. 4. With tongs, remove the greens from the water, shake the excess water off into the pot and place them in the fry pan. 5. Toss and mix greens with the ginger. Cook greens for several minutes. Remove from heat. Serve immediately. This recipe looks wonderful. I only have toasted sesame oil. Is there something wrong with using it? Is it about the flavor being better with untoasted sesame oil, or is it that perhaps untoasted is healthier? Toasted sesame oil should be fine. The recipe calls for a very small amount of oil, one teaspoon, to lightly coat the pan surface and just to fry the ginger, bringing out the ginger flavor. You can use any high temperature oil. The toasted oil may add its own flavor but since it’s a small amount it shouldn’t matter. Enjoy!